...I hang stuff outside the window all the time, but the sunlight's working against me. 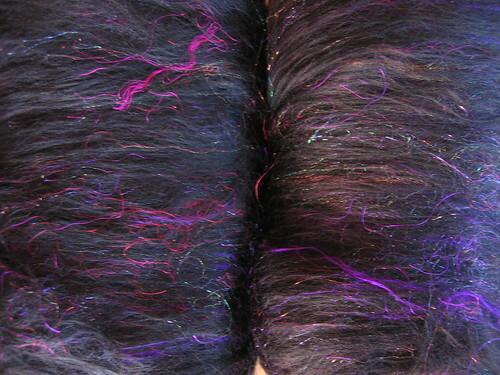 See, the batt is made of a true black superwash merino that's carded with glitz and purple/magenta sari silk fibers-- but you don't really get the depth of the black even though you can see the sari silk okay. ...with a flash, the black is true but some of the sari silk and definitely a good chunk of the glitz is washed out and lost. but, *it's not it. * It's somewhere between all three and even still not. 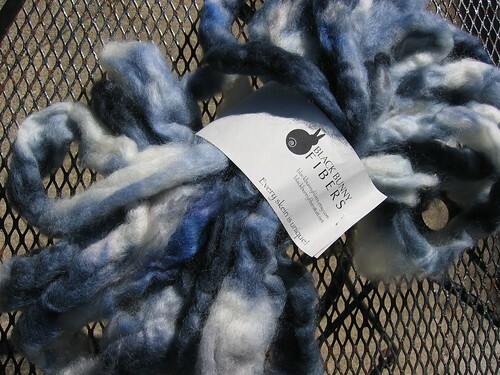 I could go on, but I've just finished plying the yarn I made from these batts, so next week I'll go on and on and on then, instead :) Josette is great to work with for special requests-- if she doesn't have these listed in her shop, I'm sure she'll help you out if you contact her. 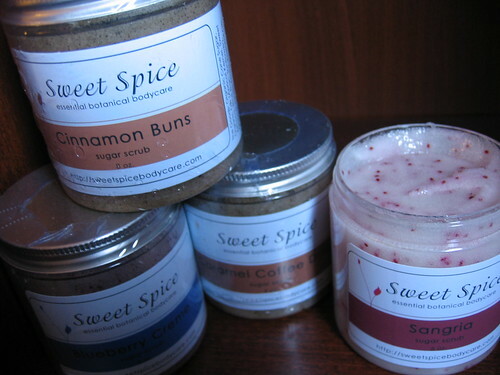 For the holiday season, you may remember that I picked up sample sized scrubs and bath salts from Sweet Spice (and some body scrubs for myself). 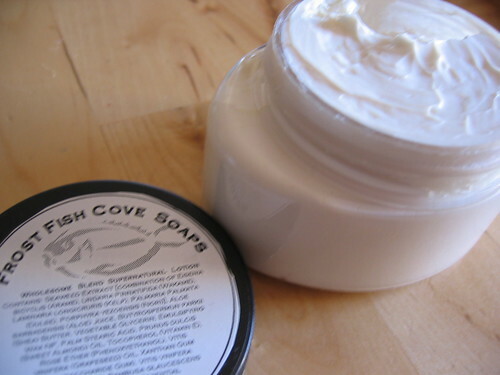 I don't know about the bath salts, but the scrubs are just awesome so I stocked up after using mine for the past months... Mike said they look good enough to eat, and for reals they do! The sangria scent I've been using recently is so cool... made with cranberry seeds :) I am pretty sure almost all of Sweet Spice's ingredients are organic, a plus on an already nice shop. 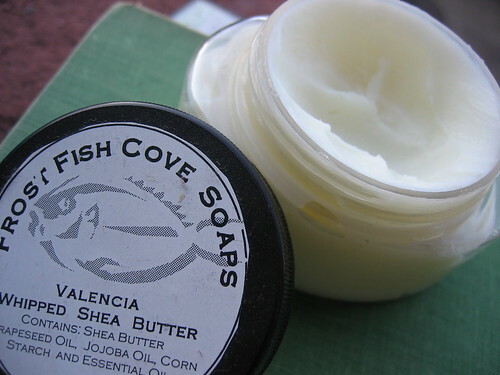 Shannon was also kind enough to send me a sugar cookie scented "shea stick" sample with my order-- and FOR REALS it smells *just* like sugar cookies! See, my local market has been carrying these incredibly soft sugar cookies piled with pink frosting and sprinkles and I try not to get suckered in but always am so really, I *know* my sugar cookie smell :) The shea stick goes on slightly grainy but melts immediately on contact with skin; the stick form is really clever-- you push up from the bottom and the stick rises, less mess. I can't help but look at this combination and think (undoubtedly inspired by the lovefest I've been substituting with Intertwined on my off-days) of spinning the alpaca into a single and plying the laceweight with the alpaca for a wrapped single, throwing some coils in there for good measure... the alpaca's tendency to grow would probably be reined in with these treatments, and... it IS called LOVE yall. 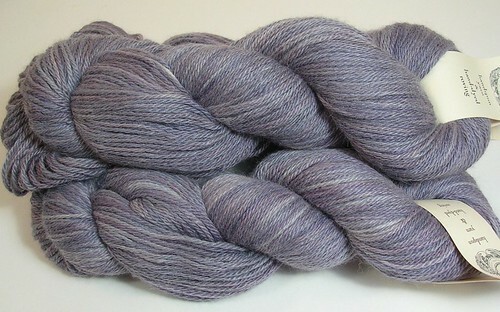 There'd even probably be enough laceweight left over for a smaller shawl, too. 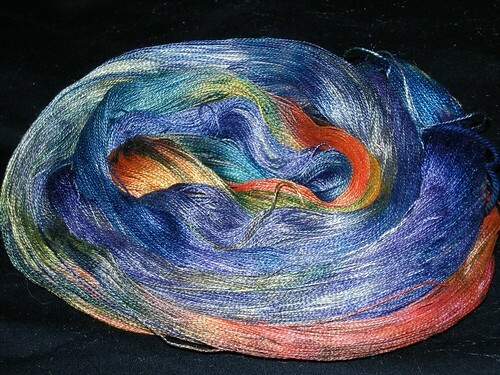 String Theory Fiber Art also has a sweet shipping deal-- free shipping on orders of $40 or more. Nice way to jump into the weekend, even if it won't be near as good as the last. Miss you! Seriously, those exclamation points hovered over my head ALL WEEKEND LONG. I am such a shy dork in person but seriously had the best time among so many people. 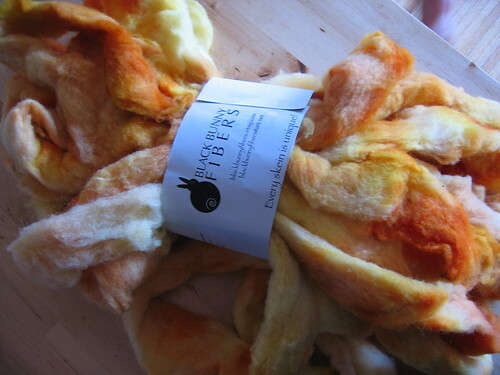 Oh, and fiber! 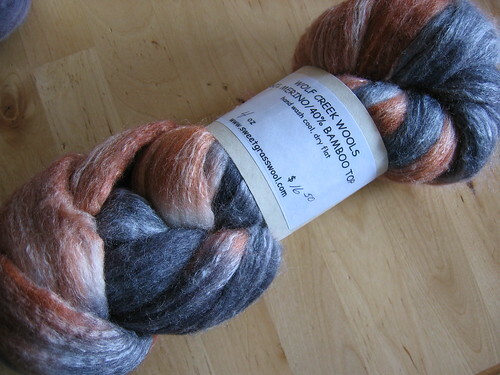 :) I *only* stopped at booths that were selling spinning fiber... it was the only way I could pare the experience of the market down, as easily overwhelmed as I get. 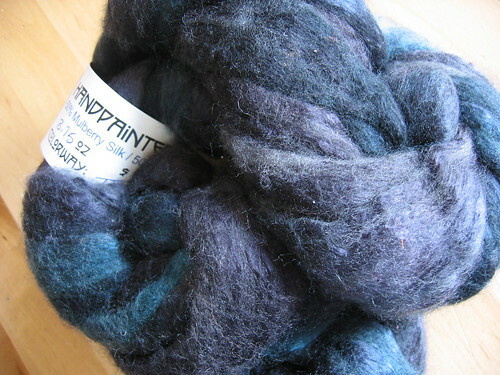 Mulberry silk/merino, 3.75 oz by Blue Moon Fiber Arts-- "thraven"
Blue Moon Fiber Arts did have several Sheep2Shoe kits for sale, and try as I might to convince myself I could see the colors peeking thru the black in their raven series of the same I couldn't justify the 8 oz purchase of superwash merino for socks (not enough to want to spin a 96% black yarn, anyway...) I did find this really pretty silk/merino in one of the ravens colorway that wasn't too black, but black and green. Really nice colorway, and a testament to how hard these colorways are to photograph. I swear I stood in the Verb for Keeping Warm/Tactile Fiber Arts booth forever trying to decide on what *needed* to come home with me. If I blocked you when you were browsing, I apologize... I was seriously mesmerized by the display! I said I'd be back and should have been, but was just wasted after finishing the entire market floor. 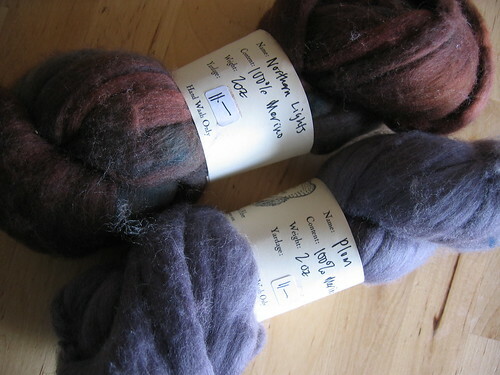 Still, these two together will be spun in alternating colors for a simple singles yarn-- perfect mindless scarf spinning and knitting, I'm thinking. 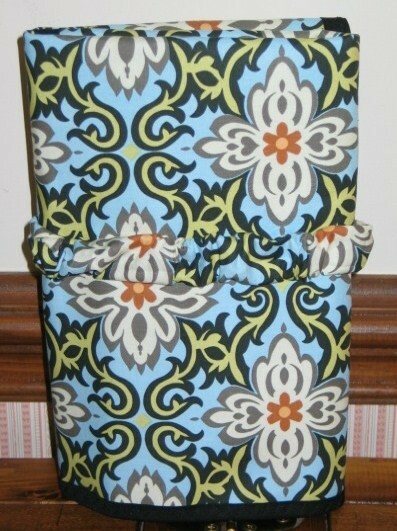 It looks totally unassuming, right? To touch it though is just a dream... and looking at the color, from grey to darker to almost a red in individual spots is just wow. 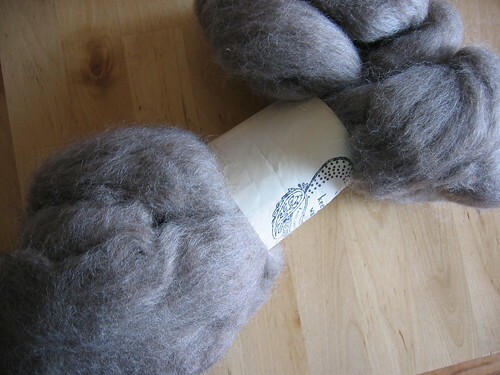 I want pounds of it to spin into a sweater for someone who loves it just as much as I do. Seriously. 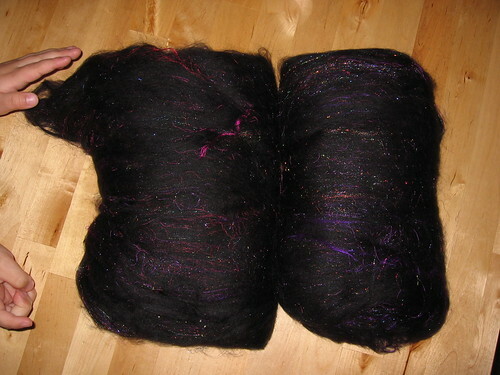 I'm glad my pictures aren't doing it justice cos yall would be bugging Kristine for it and there'd be none left, as awesome as this fiber feels. 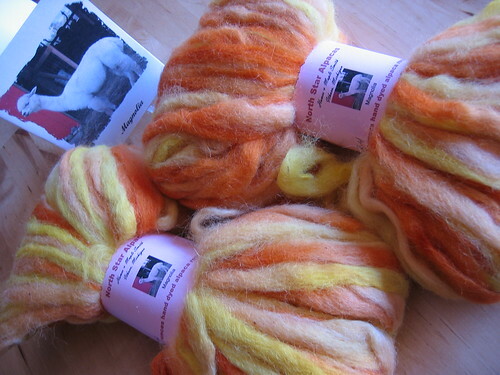 I'm not sure if it is naturally dyed, if not this was the swankiest colored sheep (short of a California Red lamb) ever. Til then, miss you (tho it's only been this long)! 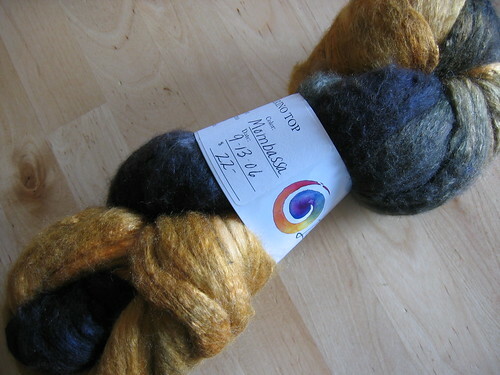 So I've been welcoming my new-to-me Schacht Matchless over the past week (one but not the only reason for radio silence)... and I realized I had some skeins of handspun spun on my lovely little Ashford Joy that I hadn't photographed yet! Oh, it is so red! Purple too, but I can't get enough red lately. 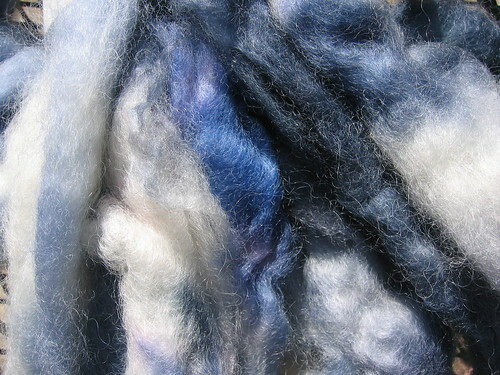 It is one of those yarns whose colors shift in the light; bright when under sun like this, more muted and heathery looking in ambient. I'm actually knitting this yarn into socks, my walkaround stst socks so they may a long time in the hopper, but they'll be so nice when done. 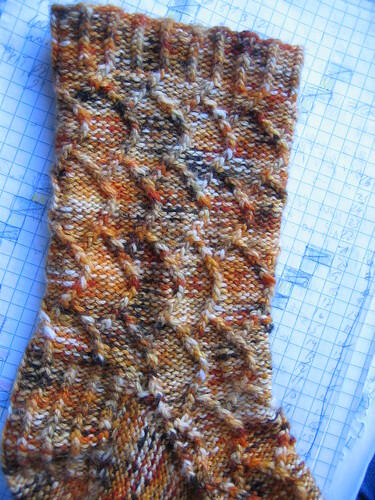 I worried that the alpaca would lend the yarn to have no stretch, that I had to knit this into a rib or pattern to help a sock keep its shape-- but the wool is helping with the bounce and I'm knitting the socks in a slightly less wide foot to help with any loosening. 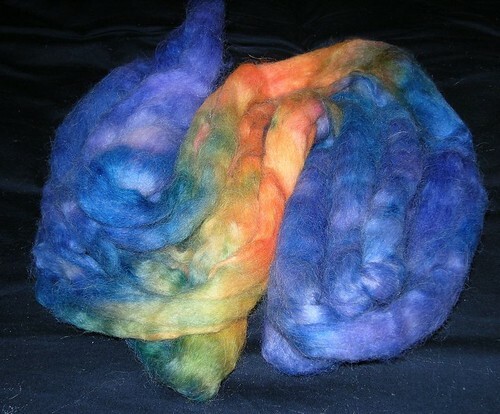 Lori did such a great job in dyeing this-- you may remember the roving from a past etsy friday. 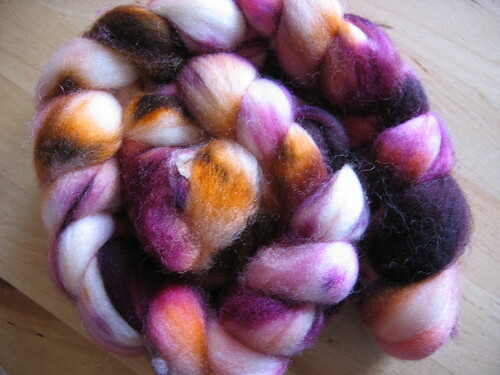 She took a base fiber that was grey, so the red and purples were more muted than if she had used a white. Such a good idea, and it ended up spinning into such a nice yarn. 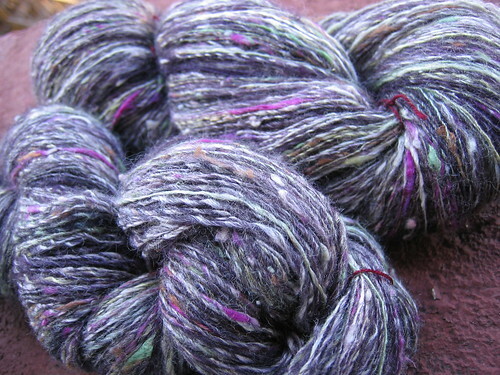 laceweight singles spun from Crosspatch Creations batt-- "eggplant"
I have no idea what possessed me. Well... maybe :) I heard the Stash and Burn ladies talking about what they were working on to wear to Stitches West, and I had also just reminded myself that my first adult sweater attempt is making me mad taking up space in my stash and I'll never finish it even though nothing's wrong with it (anyone want some yarn and half a sweater for postage?) pending... 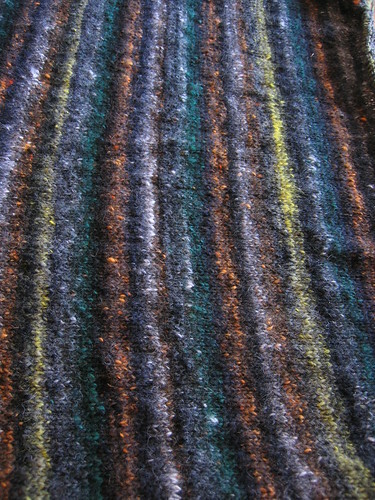 Anyway-- I started and like 5" in I decided it was way too Dolly's coat... but didn't rip cos, well I was knitting in the dark and nothing else was close at hand :) I've managed to knit almost the entire back (the stripes'll run vertically like this) and I still don't know if it's too... much. 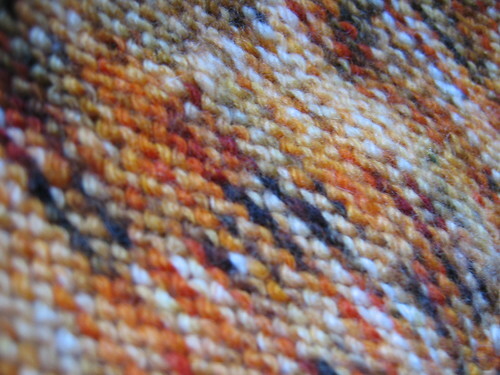 Then again, my noro kerchief is too much and I wear it ALL THE TIME. 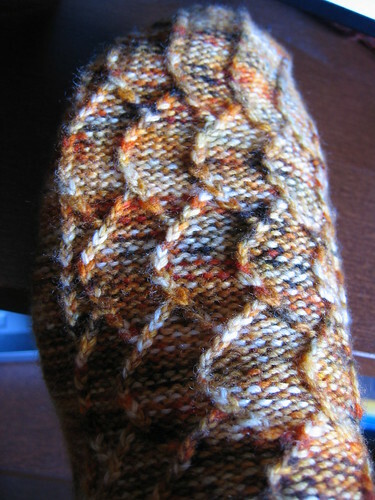 So... who knows :) Maybe I'll have a handknit sweater to wear for Stitches West. 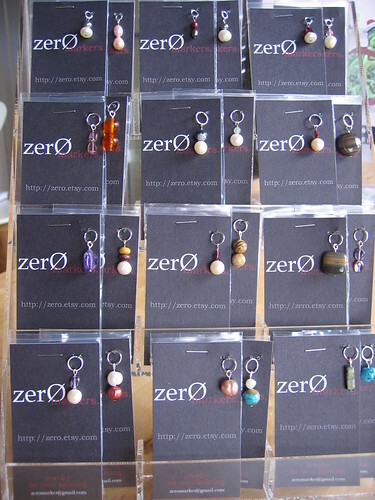 I will have a grip of zero stitch markers for Stitches though (courtesy of A Verb for Keeping Warm's booth-- booth 840 & playing in the Ravelry passport game)... more pics of my gargantuan task later. I love love love square cards. 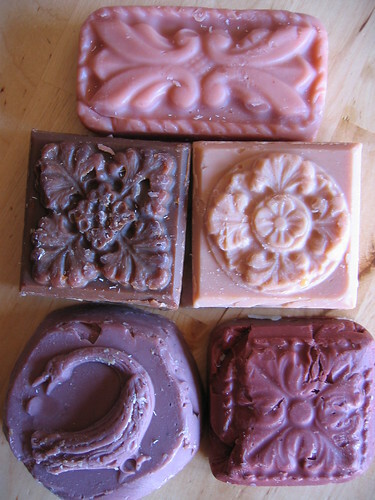 I don't know why (nonmachinable surcharge postage makes me hot! ), but Smack of Jellyfish does them so well. Sarah's branching out from her way awesome "collective noun" cards and these are two in that vein-- "you are the algae to my fungus" (I am SUCH a sucker for mycology references), and "if you were an octopus... I'd grow eight arms to hold you." Some of you are thinking, wth are those? And others of you know and are thinking, wth is SHE doing with those? 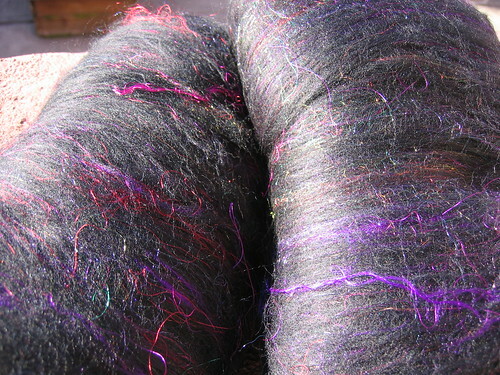 :) (They're super textured, way glitzy glammy over the top fiber batts from Loop.) I am the straightest laced spinner but lately (since purchasing and reading Intertwined) I've been thinking a LOT about branching out spinning-wise from my very serviceable, very utilitarian spinning into something else-- and these will probably be a step in that direction sooner rather than later. 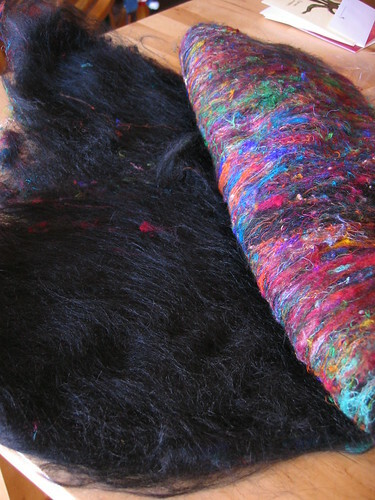 ...confetti batts, black alpaca and sari silk, and realized that the "baby" batts were made from bits of confetti batts (and others) and would coordinate well-- and I couldn't help myself. 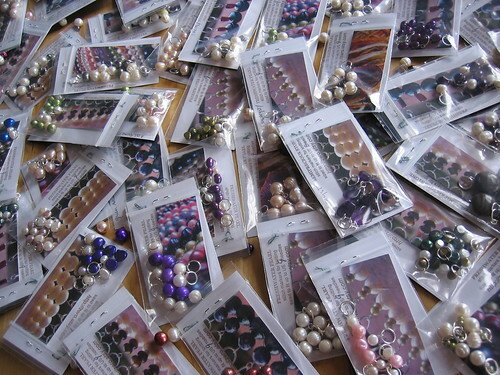 So in (all that) vein, I've been meaning to share a project in progress and since I've been not knitting at all lately (making zero stitch markers for A Verb for Keeping Warm's booth at Stitches West, playing with my new-to-me Schacht Matchless (!! ), hosting a houseguest...) it seems like a good time! 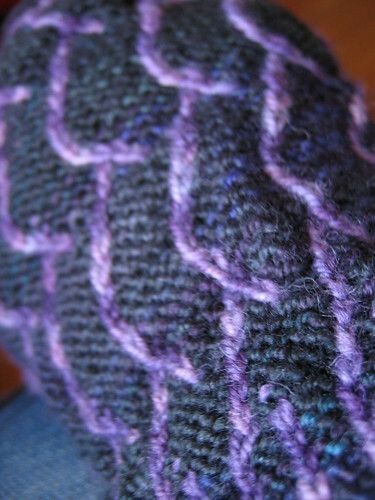 So let me back up... Yuki started with me wanting to design a continuous, circularly knit cable pattern that echoed a fishscale, a simple 1x1 cable that would translate well to small spaces and liberally use reverse stockinette so I could show the beautiful backside of handpainted yarns. It took lots of sketching and swatching to get a design that would work on the scale I was looking at and would be easy to work, but I did. I chose Pigeonroof Studios yarn (merino/cashmere/nylon blend) for the 'part one-- cables' sock not only because I just love this color, but because Krista's colorways aren't too jarring or full of varying saturation or values. You can still see the cable pattern over the handpainted yarn, and it just makes me happy when they can both hang out and not overpower one another. 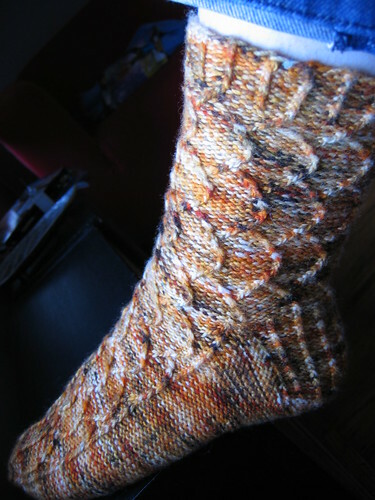 It'd work well in a solid as well, but the almost-large reverse stst spaces on this sock scream to show the way handpainted yarns excel on the purl side. I wanted this cable to work as a base for jumping off into colorwork with, and the dirty secret of it is that cables + colorwork is super awesome and if you can do both, you can do them together :) I'm getting ahead of myself though, that's part two. You have no idea how hard it was to capture the beauty of this ring. I totally didn't come close. 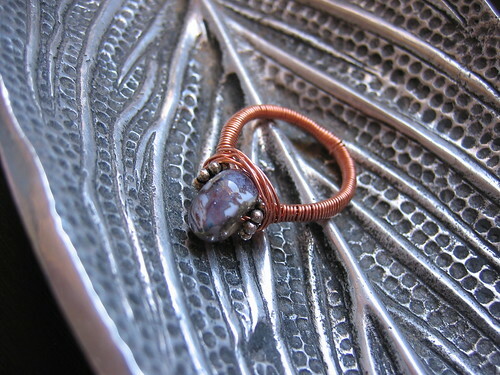 I think it was just hard to get the shift of grey to purple in the glass and how well it all works with the copper wire, how each wrap of the ring band is perfect and tight, how something that's "just" wire can be sculpted by hand into something so pretty and unexpected. 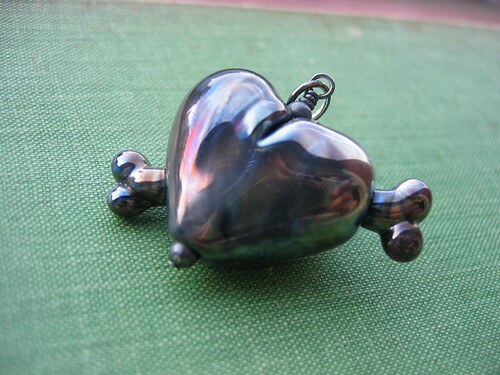 It's stunning... Cozysister has taken a handmade lampwork glass bead in greys and purples, sandwiched it between sterling silver accents, and wrapped the entire thing in copper wire as a ring, custom made for my (surprisingly HUGE) ring size. And it's awesome. 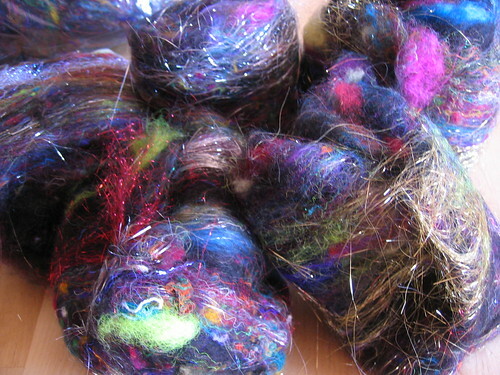 You may remember that I joined the Black Bunny Fibers fiber club towards the end of last year... this was my first installment :) Now, really and truly I'm not a club kinda girl-- I have a definite sense of what I do and don't like (though I may not be able to put it on paper... kinda like obscenity I suppose), and there hasn't been one club I've seen that I've liked *every* installment of. I also am not down for paying extra for exclusivity, not that I think it's bad but-- just not for me. 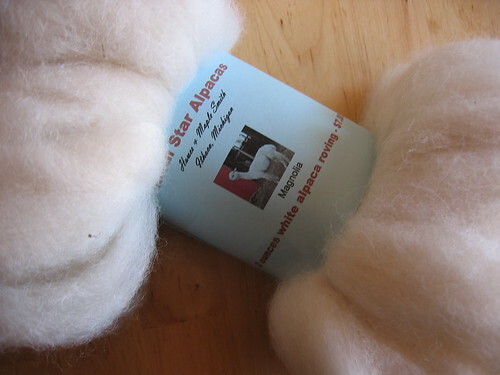 But Carol's club sounded perfect for my spinning side-- 8 oz of fiber standard, a very very reasonable price (I'm a bargainhunter at heart), and she took the time to craft a questionnaire about my color likes and dislikes. I don't expect the club to be spot on with what I like every time, but this is a very good start!! 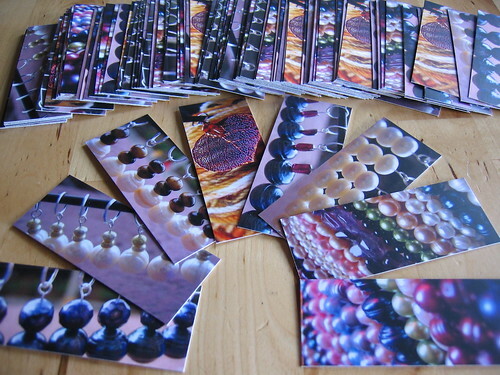 One of my favorite etsy card vendors, Smack of Jellyfish (you know-- with the alphabetical collective noun cards?) 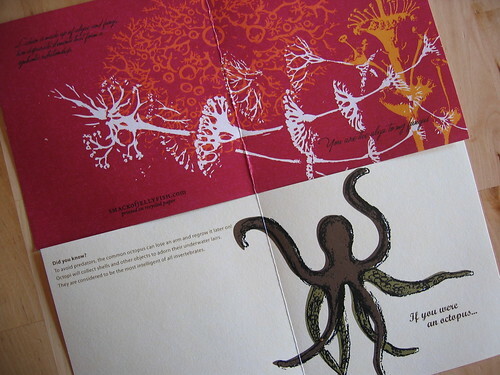 has started to branch out in other design and print destinations and I dig those just as much as her animal cards. 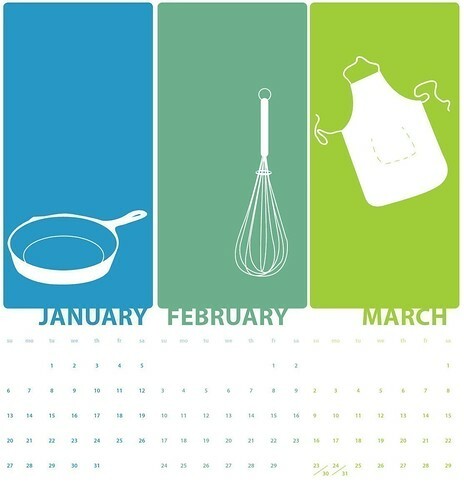 I bought this calendar as a gift and had it shipped right to the recipient from SmackofJellyfish for a belated birthday gift... right now it's hanging in an amateur chef's kitchen, being enjoyed as much as I enjoyed giving it :) I haven't seen it yet, but have no doubt it's as awesome and as well put together as everything I've bought from SoJ before. 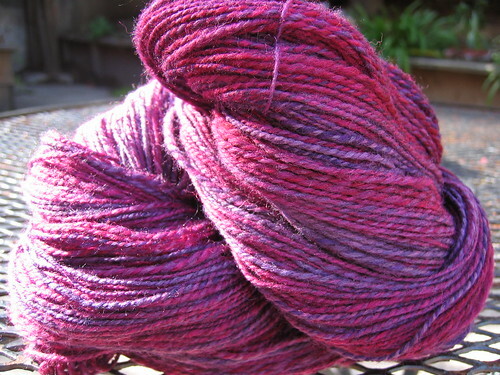 But really now-- forgetting all of that for a moment, take a look at A Verb for Keeping Warm's etsy shop (or retail storefront)... full of gorgeous yarns and fibers, many of them dyed using natural dyes. 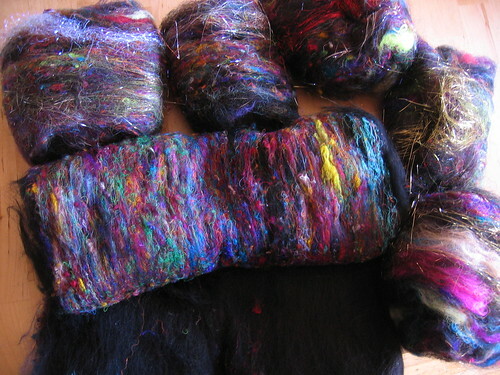 I have a serious admiration for those working with natural dyes and especially those who can coax such beautiful and varied colors from them-- notwithstanding all of the above, A Verb for Keeping Warm would have been on my must-visit list for Stitches just for the dye and fiber talents. You want another reason?! :) Ravelry is hosting a passport game (an idea seeded by Kristine's brain) and one of the stops will be A Verb's booth... lots of prizes will be given away by vendors thru Ravelry's game, including A Verb for Keeping Warm's prize of fiber and yarn and oh yeah... four 7-marker sets from zero.etsy.com (a set of markers in all of my ring sizes-- US 2, US 6, US 9 and US 13).